One-string tin can and wood stick guitars--also called pork 'n' bean guitars, spike fiddles, tin-can banjos or git fiddles--are a staple in Appalachian music. Instruments like this hail from a time when the only musical entertainment available was what people played themselves, and they fashioned instruments from whatever they had on hand. A one--string guitar is simple enough for a child to make and authentic enough to take an adult a lifetime to master. Whether you make a four-string tin can banjo or a one-string tub-thumper, the basic instructions are the same as for this very simple model. 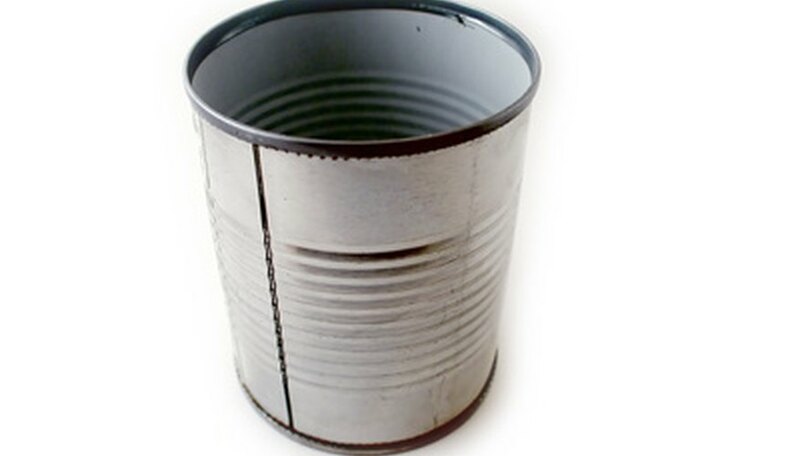 Turn the can open-side down and use the hammer and nail to make a small hole through the center bottom of the can. Place the can on the stick so the can's length is parallel to the stick, with the open end one inch from one end of the stick. Wrap two loops of tape around the stick and can to hold them together. Twist the screw eye into the wood one inch from the other end of the stick. Place it so it lines up with the can. Drive the nail two-thirds of the way into the bottom end of the stick. Tie one end of the guitar string firmly to the nail and hammer the nail in the rest of the way. Thread the free end of the guitar string through the hole in the tin can and up to the screw eye. Wrap it through the loop once and then over and under the guitar string two or times. It's normal for a few inches of string to stick out when you're finished. Tighten or loosen the screw eye to tun the string. Play the guitar by plucking the string. Use any kind of wooden thing if you don't have a stick: a piece of 2-by-4, a dowel or a discarded crutch. Substitute kite string or heavy-gauge fishing wire if you don't have a guitar string. Try sticking a screwdriver through the eye and using it as a handle if your screw eye is difficult to turn. Drive the stick through the can by using a cold chisel to make holes on opposite sides of the can near the closed end if you prefer. Fasten the can to the stick by wrapping tape, wire or string around the stick near the holes in the can so the can can't slip down. If you over-tighten the screw eye you will break the guitar string, so keep the guitar well away from your face when you're tuning it; a snapped-back guitar string hurts.